When heating contractors size a furnace, they size it so that on the coldest day of the year, it will produce sufficient heat to keep your home to the desired temperature set on your thermostat. Here in the Northwest where our outdoor temperatures tend to be mild a majority of the time, the full output of a furnace usually isn’t needed. Because of this, HVAC system manufacturers have developed furnaces with a high and a low output. 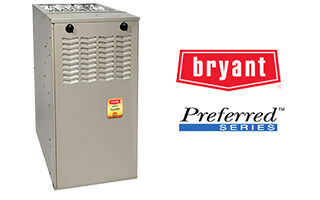 Bryant’s Preferred series gas furnace utilizes this two stage operation in an effort to minimize noise, balance the temperature throughout the home, reduce temperature swings between heating cycles, reduce draftiness, provide you with cleaner indoor air, and preserve the life of the unit with fewer on and offs. And now the Preferred series furnaces have a variable speed fan for more efficient operation and a wider range of functional fan speeds.